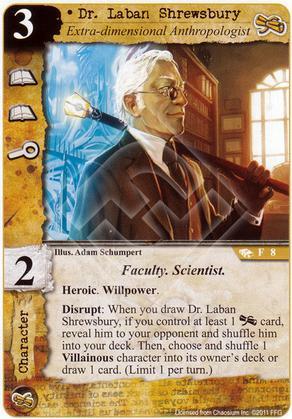 I could make the case for the good doctor here to be a 3x in any deck that's at least 1/3 Miskatonic. That's especially true if your deck can draw lots of cards. Literally the only time you might regret drawing him is if you draw two of him in the same turn and you already have one in your hand. And against Mythos decks, Laban can be a free Pushed against your opponent's biggest baddies. 5/5 all day long.